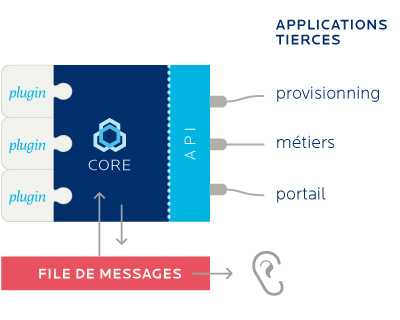 All BlueMind operations go through web service APIs, which are the single entry point to BlueMind. This technical choice ensures the consistency and completion of all operations carried out through the BM-Core component. In particular, it insures a simple integration with all types of components and third-party software thereby bringing facilitated interconnexion with Information Systems. In addition to web service interaction, we’ve designed a plugin system that allows you to modify and extend BlueMind’s functionalities. This technology means you can now easily adapt or build upon the BlueMind solution, without modifying it. Furthermore, because extension points are kept from one version to the next, BlueMind plugins continue to be compatible with future versions: the changes you or your integrator makes continue to work even after updates, whether minor or major. Plugins also allow you to modify the User and Administrator Interfaces. By combining web service APIs and plugins, BlueMind makes it easier for you to develop additional functionalities. These developments are currently centralized and distributed through a dedicated platform: the BlueMind Marketplace. Some of our technology partners have had their work published: Avencall on unified communication, Vade Retro on integration with its security tools, or Numvision on large file sharing integration.